I have a DWARF/LIONHEAD rabbit, he is about 3 years old. He has no bottom front teeth so I have to get his top front teeth clipped at least once a month because he can't chew when they grow too long. I have only had him for about 2 or so months so I don't know if he was born without the bottom teeth or what. What does it mean if he has no bottom front teeth? Charlie looks like a sweetheart! Thanks for sharing his photo. I have never seen a rabbit born without teeth. The most likely scenario is that this rabbit had some sort of health issue, such as possibly a root abscess, and a vet pulled the lower teeth. But this theory seems a bit 'off' to me, since the vet would then know that the upper teeth would require regular trimming. And of course, every time you get its teeth trimmed it costs money, right? How much per visit? 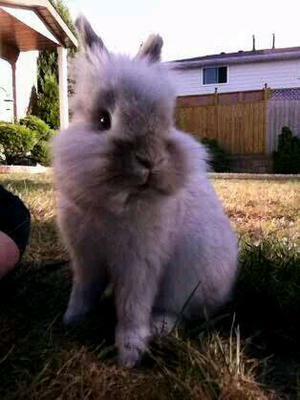 Did you know before you accepted this rabbit that it would require continual maintenance? Perhaps you could learn how to do the clipping yourself? Going forward, the best case scenario would probably be to ask a vet to yank the upper two incisors with their peg teeth (total of 4 teeth). This would leave the rabbit with all of its cheek teeth in the back of its mouth to chew with. It will learn to pick up food and hay with its lips in order to move the food to the back of the mouth for chewing. I knew when I bought him that I'd have to trim his top teeth, but I didn't know it was because he didn't have any bottom teeth. I've been taking him to the vet to get them clipped and it's about $25-30 each time about 1 time per month. I have clipped his teeth myself before but I'm not very comfortable doing it myself. Return to Info on Rabbits.